Petrol. We all need it, and in Brisbane it seems we all have to pay through the nose for it. While the goal posts keep shifting to suit the other team, and the playing field for this game in which motorists are the pawns is never going to be level (hint: the guys who start with all the money leave with even more money), there are some things you can do to at least make the whole process of keeping your car on the road a little less painful. Image by earl53 from Morgufile. 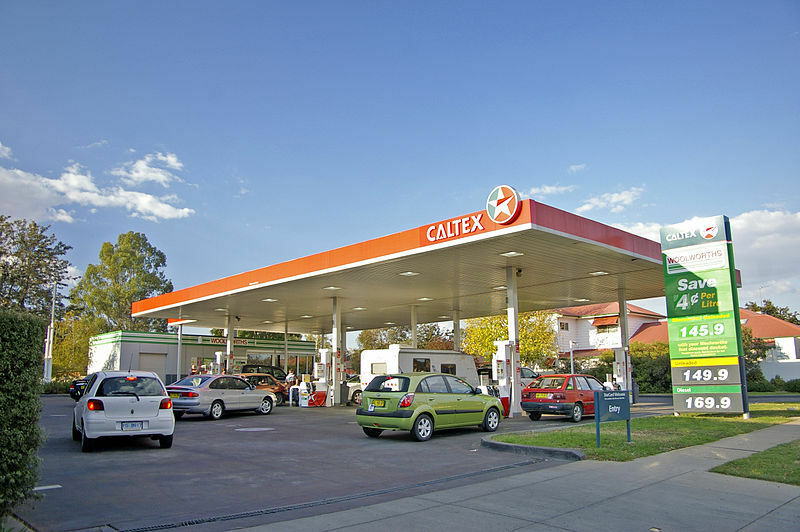 Below are some tips to follow that will help you find the cheapest petrol in Brisbane. Remember, knowledge is power: not the "phenomenal cosmic power" of the genie in the lamp, but power at least to keep some of your hard-earned cash in your wallet for a bit longer. At least it's not hard to recognise who they are - big multinational oil companies and supermarket chains who, despite their "we're wonderful corporate citizens and we want to make you happy" advertising, are actually there to make a buck (or $365 million profit per day, as the world's 5 largest oil companies did in 2011). And there's nothing wrong with making a profit in a capitalist society. Just be wary of the rhetoric and don't think because they say they're giving you a great deal, that they are. The Australian reported in 2012 that Coles and Woolworths accounted for 50% of national petrol sales while only owning 18% of petrol stations, courtesy of their discount dockets, no doubt. However, according to a 2012 Australian Automobile Association report supermarket discount dockets are not necessarily good for the overall price of petrol. 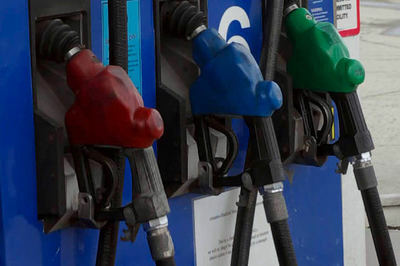 When supermarket petrol retailers offer 8c per litre discount, that price is often lower than the wholesale price at which independent operators can buy their petrol. The result? Independent retailers leave the market, reducing overall competitiveness and tightening the grip of the big guys on our hip pockets. The other major player you should be aware of is the Australian Competition and Consumer Commission (ACCC), whose role it is to monitor retail fuel prices. They also investigate complaints, but have never found any evidence of collusion among the big players, despite the fact that they all, apparently independently and coincidentally, adhere to the Petrol Price Cycle (more about that in Rules 2 and 3). You can access Petrol Pricing for Dummies at the ACCC website here. You'll find a concise explanation of the factors that affect petrol prices including international benchmark prices, the value of the Australian dollar, and wholesaler and retail costs. My personal favourite is the very small section devoted to petrol price cycles which states, among other things, that "Price cycles are the result of deliberate pricing policies of petrol retailers and not directly related to changes in costs". So, all the bleating you hear from oil company executives along the lines of "our hands are tied" is just more corporate-speak. 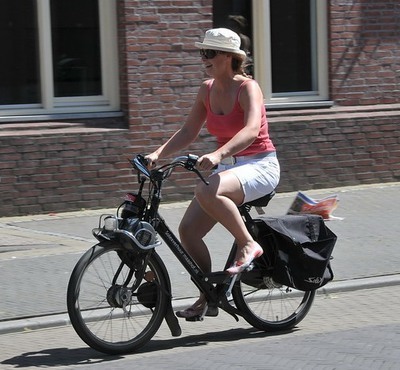 This one isn't quite as easy to do as it was a couple of years ago when everyone knew petrol would be cheapest on a Tuesday or Wednesday and most expensive on a weekend when you needed to fill up. The big boys have decided to mix it up a little and the petrol price cycles have lengthened in most major cities, and are now not so regular (certainty must have been eating into those profits!). You can access graphs showing the latest Petrol Price cycles here on the ACCC website. 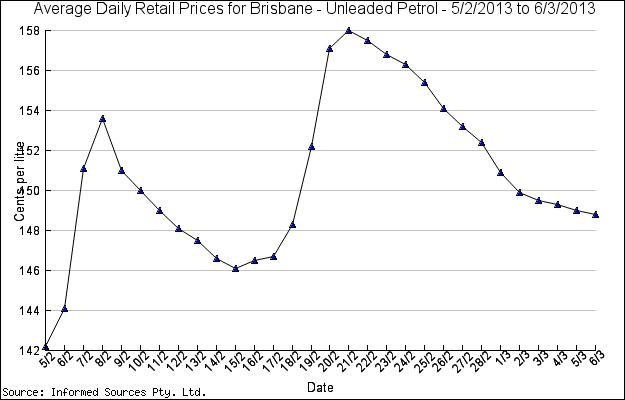 The graph below shows Brisbane's price cycle between 5 February and 5 March 2013. Call me a cynic, but I can't help but note that the upwards trajectory of the line is steeper than the downwards one. Also note that the high and low points just keep getting higher. 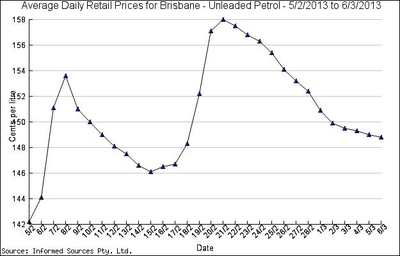 You can also find the cheapest and most expensive petrol-buying days in Brisbane for the past week. Thanks to a company called MotorMouth and the RACQ you can now find the cheapest petrol in your area at the click of a mouse. With MotorMouth you can enter your location and petrol type and search online here or sign up for daily email price alerts here. You can also access this information here on the RACQ website. Be aware that there can be huge differences across Brisbane on any given day. My check this morning (7 March 2013) revealed that if you live on the north side of Brisbane there were many petrol stations offering unleaded petrol at 142.9c per litre, while the cheapest you could buy in the south was 146.7c per litre. Obviously driving across Brisbane to buy cheaper petrol somewhat defeats the purpose but if you traverse Brisbane on a regular basis there are savings to be made. We might all need to switch to these. Image by FaceMePLS from Wikimedia Commons. Why? Because we'd all like to pay a little less for petrol. The best way to bring down the price of fuel is for EVERYONE to stop going to one big player. After 2-3 days with no customers they all drop their price and the rest will follow suit. PEOPLE POWER! Thanks for the info, I used to buy my fuel at Coles & Woolies but now buy my fuel from FREEDOM fuels, they give a 4 cent discount without any dockets, you only need to buy a minimum of 40 litres, too easy. The discounts are a false economy, if you monitor the daily fuel prices you will see they increase the price while giving you a discount, which you gave them more money for when you shopped at woolies ot coles who also inflate their grocery prices relative to other supermarkets. Also has anyone noticed the cycle going from 2 weeks to 3 weeks and back to 2 weeks again? Thanks Freedom for opening a petrol station down the road and keeping the big 2 on their toes. I refuse to shop at the Red one as they have for years been the first to raise the price of petrol and the last to drop it. I shop at Aldi now and save .Discount vouchers are a joke.